Cork Airport’s first transatlantic flight took off at the weekend when Norwegian Air International left for Providence, Rhode Island, in the northeastern United States. According to the airport’s head of communications, ‘Kevin Cullinane’ the bookings from passengers travelling in either direction are ahead of expectations. Managing director Niall McCarthy said the flight marked a “new chapter” in the airport’s history. “With the chile winds of Brexit looming, tourism diversification is critically important to maintaining our strong regional economy and the US is a key growth market for the south of Ireland now and going forward,” he said. The new service will operate three times a week, linking the south of the country to the greater Boston, Rhode Island and New England areas. Norwegian had to wait three years to get permission from Washington’s department of transportation allowing it to fly to the US. The airline’s permit came through in December and it began selling flights earlier this year. 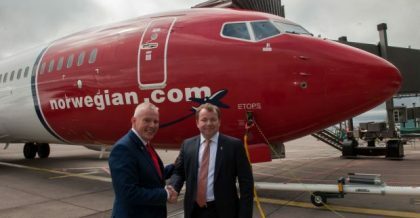 The carrier, an Irish subsidiary of Norwegian Air Shuttle plans to launch a transatlantic service from Belfast, Cork Shannon and Dublin. One of the first passengers on board the flight was Ciara Judge (19) from Kinsale, Co Cork, who was the winner of the 42nd BT Young Scientist and Technology Exhibition in 2013. “I go over and back to America a lot. I worked in MIT for the past two summers. It makes such a difference for me to be able to fly transatlantic from Cork because I fly transatlantic a lot. This year alone I have been six or seven times. Travelling from Dublin or London adds so much to the travel time,” she said. Previous When pigs fly: Demand rises for live animal transport.